ROBERT LEE ESKRIDGE | Geringer Art, Ltd.
ROBERT LEE ESKRIDGE (American, 1891-1975). Painter, author, muralist and illustrator Robert Eskridge — a lineal descendant of both General Robert E. Lee and General George Washington — was born on November 22, 1891 in Philipsburg, Pennsylvania. After moving to Southern California he studied at USC, and the Los Angeles College of Fine Arts. He served in the army during WWI and was stationed at Camp Jackson, South Carolina. Later he studied at both the Art Institute of Chicago, and the Chicago Academy of Fine Arts. In Chicago he was a member of the Chicago Society of Etchers, and left behind a set of murals depicting Marco Polo’s journey in the lobby of the Palmer House Hotel. In 1920, when Eskridge was living on Coronado Island, his prints were shown at the Little Gallery of the San Diego Museum of Art. He then studied in Paris with both George Senseney and the cubist André L’hote. Eskridge travelled extensively and in the 1920s he spent eight months on Manga Reva an island 1,000 miles south east of Tahiti with a population of less than 200 inhabitants. There he executed numerous paintings, drawings and watercolors. After returning to the US, he wrote and illustrated a book titled “Manga Reva, The Forgotten Islands”. After moving to Honolulu in 1932, Eskridge taught at the University of Hawaii, and worked as a WPA Muralist. He also wrote and illustrated” UMI, The Hawaiian Boy Who Became a King.” In January and February of 1933 his work was featured in an exhibition at the Honolulu Academy of Arts.In Hawaii, Eskridge was friendly with many other artists including Don Blanding who he had met in art school, and also with Georgia O’Keefe who gave Eskridge her paints and palette after she visited Hawaii in 1939. He left Hawaii after Pearl Harbor and spent the duration of the war in Southern California, teaching at both USC and Scripps College in Pomona. His watercolors were shown at the Palace of the Legion of Honor in San Francisco in 1943. After the war Eskridge returned to Hawaii, painted watercolors, oils and murals. 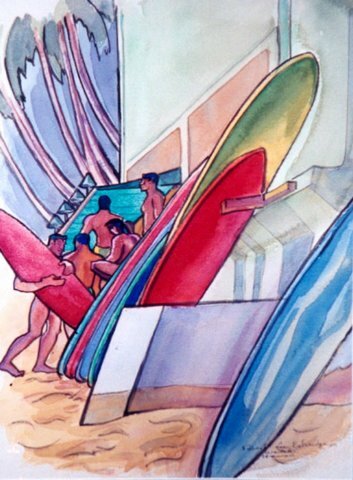 Among his public works were a series of watercolor paintings for the Kona Inn, and murals for the Ala Moana Sports Pavillion. Robert Eskridge died in Honolulu in 1975. After his death, his wife Helen gave his autobiography in the form of diaries to the Honolulu Academy of Art. She later also donated a large group of his watercolor paintings to the Academy.